ON THIS DATE (October 4, 2003) ... Pinch hitter Trot Nixon drilled a two-run home run to the center-field bleachers off Rich Harden in the 11th inning to give the Red Sox a 3-1 win over the Oakland A’s in Game 3 of their Division Series tonight, prolonging Boston’s season at least another day. With one out, Doug Mirabelli poked a single to right, setting the stage for Nixon, who couldn’t have picked a better time to collect his first hit. Prior to Nixon’s blast, the biggest hero for the Red Sox was the relief corps. The much-maligned bullpen took over for Derek Lowe and didn’t allow a hit over the final four innings, the first three by Mike Timlin, the last by Scott Williamson, the winner. On the brink of extinction, the Red Sox were offered everything short of mouth-to-mouth resuscitation by the bumbling- beyond-belief A’s. After nine innings, nothing was decided as the game went extra frames tied at 1-1. 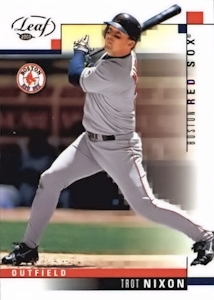 Jason Varitek was the central figure in a play that cost the A’s a run, when Eric Byrnes, attempting to score from third on Miguel Tejada’s tapper in front of the plate in the sixth inning, was sent sprawling when Varitek stuck his left shin-guard in Byrnes’s path. Byrnes, wincing in pain, shoved Varitek in retaliation as the Sox catcher hustled to retrieve the errant throw by Lowe, which was rolling toward the backstop. In his anger and agony, Byrnes neglected to take care of business namely, to tag the plate. Varitek, ignoring Byrnes’s shove, tagged the A’s center fielder out and pumped his fist in triumph. After an intentional walk to Chavez, the A’s eventually scored the tying run when Ramon Hernandez’s slow bouncer skipped under the glove of Sox shortstop Nomar Garciaparra, who was charged with a tough error. By the eighth inning, it became a battle of bullpens. The Red Sox group was the most impressive. Timlin set down the A’s in order in the eighth, ninth, and 10th. Williamson came on for the 11th and was perfect.